In non-Selkie news, I just wanna share something fun with everyone. I picked up The Sleep of Reason a bit ago and just started reading it. 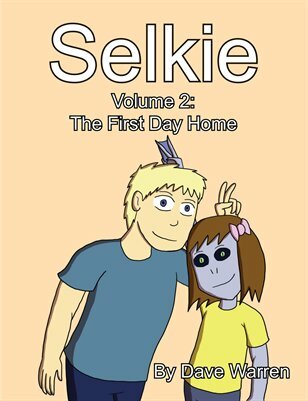 It’s an independently produced anthology of short horror story comic strips, many of which were written and drawn (and in fact published) by webcomickers. It’s a good read if you like horror stories. crap i thought she was using herself as bait to catch him on camera atacking her. It’s not excluded. Won’t be pleasant for the bait, though. Actually, given that Jessie is RIGHT THERE, it may be very pleasant for the bait. Especially if Selkie has the sense to get Jessie to hide, within earshot but out of sight, until Truck further incriminates himself. IF Jessie’s smart enough to hang around closely enough – and same goes for Selkie. Well thank goodness the teacher is there. Now when Truck the Thug shows up to pound her she’ll have someone there to see and protect her, and hopefully put an unequivocal expulsion smackdown on Trunchbull. Doubt this will open up the eyes of his parents though. Their attitude reeks of what’s wrong with the delinquent children of today. It was already established that there were at least two adults in the library with Selkie, but yeah: it’s good to know Miss Flower is in grab-crazy-Truck-right-away range. What’s super awesome is that none of the teachers seem to have noticed Selkie laughing at Truck. Not that it would justify his likely actions in any way, but the absence of that excuse could help force the Trunchbulls to realize how aggressive their son truly is. Heh, at first I read your “bring a sketchbook” as you wanted us to all bring sketchbooks. I had a sudden vision of you standing in a circle of faithful readers drawing you. What can I say? It’s 4:17 in the morning. I really like the panel where she remembered, it looks like it could actually be a memory. And Selkie learns a valuable lesson about when it is not advisable to gloat. Jessie with cartoony flailing anime arms? I now demand auxiliary art of this Dave! The memory panel works well with the art style of the strip, and is VERY well done. Bonus points if Truck is so angry that he forgets himself and punches a teacher.